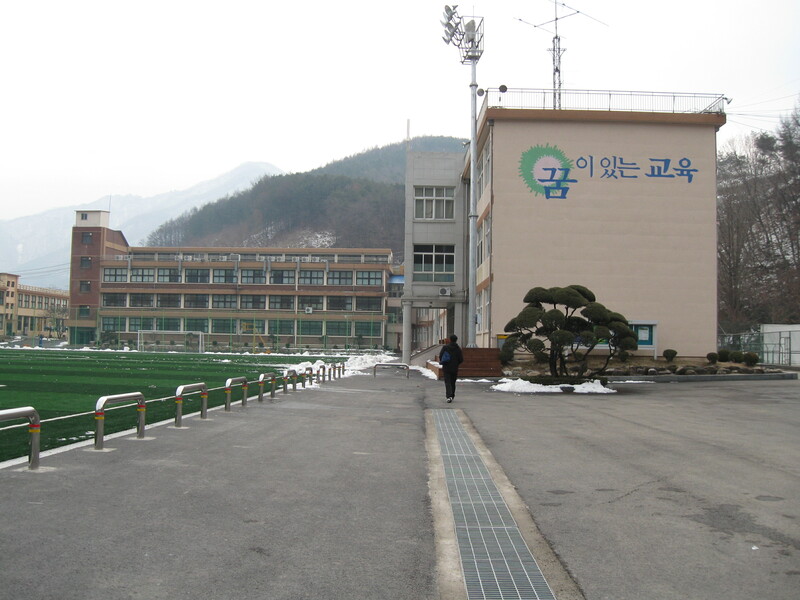 청평고단핰쿄 CheongPyeong High School – Hello Korea ! So this is the technical high school where I work, with a total student body of 300. 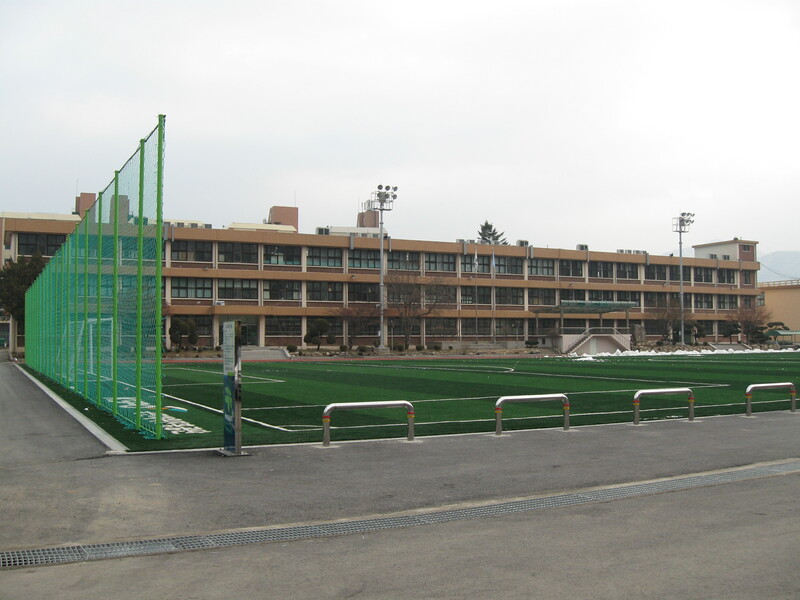 It actually has a much larger footprint than the last school, where I had 600 grade 1 students, (10th graders) so that was six times as many students on less property. There are only 2 Korean English teachers here, my co-teachers, Miss Lee and Miss Yu. One thing I never get used to is the English [romanization] spelling of Korean — especially names. Many names, especially the last/surname/family name, are spelled with the older romanization system, and most common words and many first names are spelled with the newer romanization system. So I never know which one to use. For example, my co-teachers: Miss Lee. Her name is spelled 이 which is pronounced like a long ‘e’, and spelled phonetically in Korean as it’s pronounced. But Romanized, it’s Lee. Where the hell did the ‘L’ come from? And the typical name Park. It’s spelled ㅂㅏㄱ (bak) The “b” is often pronounced somewhere in-between a “b” and a “p” sound, but where the hell did the ‘r’ come from? My name is Suh, Yung Sook. That’s under the old system. Under the new system, is would be spelled Seo, Yeong Sook. But if I had a student with the same name, it might be spelled Suh, Yeong Sook. See how confusing it is? I guess it just doesn’t matter to Koreans, because in hanguel, it’s always the same! ha ha ha! I think there were 13 Korean English teachers at the last school. Then, I gave my lecture about why they should learn English to all the students, after which I had to figure out how to create a different curriculum for each grade. So I made up three different lessons, and after teaching a grade 2 class, I was taken aside and criticized for making the lesson too difficult. So I taught another grade 2 class, and the lesson was clearly accessible by all the students. After a week of these critiques by Miss Yu, I got really frustrated and asked just WHAT was the student’s levels? It took a lot of painful dialogue to figure out that the classes for each grade had been divided up into two levels: low and high, and that they’d (sort of) barely mentioned it when I was interviewing with them, but they had never bothered to show me which classes where low and which classes were high. After some more experimenting, failing, and getting critiqued, I finally figured out that the grade 3 (seniors) low level class was lower than the grade 1 (sophomore) low level class. That the grade 1 low level class was higher than the grade 2 high level class, and that the grade 3 high level class was higher than the grade 1 high level class. Confusing, right? So I bagged the grade levels altogether and now only teach by English levels, and my calendar is this confusing color-coded matrix. But here, I have to develop 3 levels of classes. To complicate things, grade 1 gets seen by me twice a week, low level and high level. So that’s 5 classes I have to prep for. To further complicate things, I give the entire school a 10 minute morning broadcast four days a week, for which I am given an hour prep for each broadcast. But the broadcasts actually take me almost two hours each to prep for. So I’m totally swamped and take my work home with me and I’m lucky if I get an hour or two away from lesson-planning each day. So, I don’t think the Architecture class is going to continue being a problem. Yayy! BUT all in all, the co-teachers I have are AMAZING and FANTASTIC! They step up and translate when it’s needed. They elaborate on things I say so the kids understand it. They are interested in and recognize the importance of culture as a component of communication. They really like my teaching style, even though it means more work for them. Hell, I really like my teaching style too, even though it means more work for me. And, I REALLY LIKE the students! And the school culture! It’s more like a big family here. I like them because they’re more like me, have the same values I mean, if that makes sense. They recognize b.s. when they see it, they’re very real and down-to-earth, they’re not willing to sacrifice who they really are to get ahead, they like their lives in the country, and it shows in the spring in their step and the smiles on their faces. They make me smile all the time. I find myself patting them affectionately on the head, or laughing at their mischief, or totally getting where they’re coming from if they act up, and totally feel for them when they’re getting yelled at. And in a weird way, they are much more adult about their English classes than the students at Baekyoung were. The class is a treat to them and not just an opportunity to not study. The native English teacher is interesting and not just a toy to abuse. They actually listen. Some even take notes. Some of the rougher and tougher kids even talk a lot in English, as if they’re making light of it, but actually they’re interested in it, you can tell. The students here have it pretty good. The school is clean and bright. Nobody’s beating them. The rules are pretty clear. Everybody knows everybody. There’s less stress and worry in the air. The boys’ hair is too long, and nobody cares. The girls are allowed to wear pants too, if they want, and about half do. And they’re not covered in make-up and constantly looking at themselves in mirrors. The cool kids all peg their pants. The boys have to remember to take out their piercings when they get to school. The students are all about after-school activities as much as school activities. It’s just more like an American high school with American high school students in a lot of ways. And, I learned a lot during my year of hell last year. I learned I talked too much. I learned I did more that interested me than what interested them. I learned more about Korean culture. So this year, I’m more able to give them what they need. This year, I’ve got a sort of loose formula I work around. My goals, that I don’t always meet, include: a new bit of slang or a new useful expression, some phonology practice, some cultural point, and dialogue practices that are ONLY relevant to them personally or in the near future. I’m teaching much more of a survival English than an academic English, because talking should come first before reading and writing, and we need to get them to talk, and not six years after they already know 2,000 words. So right now I’m getting them to think about what they are doing each and every minute of the day, and to ask themselves, what am I doing in English? and to talk to themselves in English. And I’ve asked the high level students to start journaling. Um, I also tried to introduce a collaborative project with students in another country, but the interest in that seems mixed. We’ll see…And, I can’t be more thankful for all the intense translation I get from my co-teachers, because with that I can explain in detail my intentions and thought process and empathy for the students, so they are all fully aware that I’m working hard to make the whole process easier for them. I can also, through translation, explain my own difficulties with Korean and how language learning difficulties are universal. I am trying to be, for them, Mrs. Kim. This is a doll. doll. That is a suitcase. That is a table. The suitcase is on the table. This. That. This. That. Doll. Suitcase. I put the doll in the suitcase. in. out. in. out. (as I’m putting the scary molar baby puppet doll in and out of the wooden suitcase) I cover the doll with a blanket. blanket. The doll is under the blanket. The blanket is on top of the doll. Where is the doll? Where is the blanket? Where is the suitcase? This is me. I wake up. wake up. I look at the alarm clock. alarm clock. I sit up. sit up. I get out of bed. get out of. (images of me with naration) Dan wakes up. He looks at the alarm clock. He sits up. He gets out of bed. (images from a story with captions) I wake up. I look at the alarm clock. I sit up…(images with captions) And then, just images with no captions, students saying them on their own. It’s a really winning scenario. I’m going to like it here, and I hope all the class prep I’m doing now will mean I can relax a little more next year. Good job. I like you. “I really like my teaching style too”. Wow! You are a good teacher.